GAITHERSBURG, Md., Oct. 16 /CSRwire/ - Sodexo, a food and facilities management company committed to improving Quality of Life, announced today it was named 2018 Business Partner of the Year by The National Association of College Auxiliary Services (NACAS). 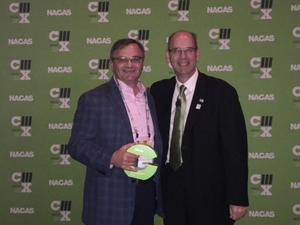 Image Caption: Sodexo was named Business Partner of the Year by The National Association of College Auxiliary Services (NACAS). Aubry Wooten, SVP, Sodexo Universities accepted the award from David P Wahr, CASP, Director of Business Operations, Owens Community College and 2017-18 NACAS President.